Last month, Paul Guay, long-time pastor of the Grace Brethren Church in Mabton, Wash., was forced to retire due to health reasons. His youth pastor, Caleb Schlegel, posted this tribute on Facebook just before Paul took the pulpit for the last time. It is reproduced here with Caleb’s permission. Paul and his wife, Jane, have since moved to their retirement home in Idaho. In just a few hours Pastor Paul is going to climb the steps to our pulpit for the last time in his 15 year ministry in Mabton Grace Brethren Church. 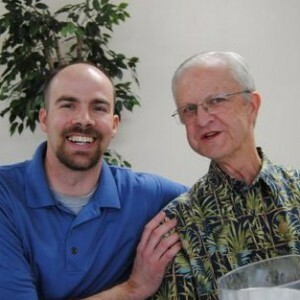 Through nearly 800 sermons, countless weddings, funerals, men’s groups, prayer meetings, and counseling sessions we have rejoiced in the good times and mourned in the hard times together. Jesus said plainly “A new commandment I give to you, that you love one another, even as I have loved you, that you also love one another. By this all men will know that you are My disciples, if you have love for one another”. – (John 14:35). Pastor Paul and Jane have lived this commandment out for me better than any people I have ever known. Jesus said the greatest commandment was to love the Lord your God with all your Heart, Soul, Mind, and Strength and the second was like it, to love your neighbor as yourself. I have seen Pastor Paul bend over backwards to reach out to people that most would have walked away from happily. I pray that my ministry, my relationships with friends, family, and especially the Lord would follow his example. I followed Pastor Paul as he followed Christ and we follow Christ together!!! I even have had the greatest joy of serving along side him for 3 years!!! “Thank You” could never even come close to expressing the love and appreciation I have for this man. I catch myself repeating Elisha’s words after Elijah was taken from him in 2 Kings 2:12 “my father, my father, the chariots of Israel and it’s horsemen!”. To watch God work over the years and the lives of so many of our people blessed by the work that God has done through Pastor Paul’s faithfulness to God’s Word has forged in my heart a love for the Bible and our Savior that surpasses all human reasoning. Jesus said “come unto Me all who are weary and heavy-laden, and I will give you rest. Take My yoke upon you and learn from Me, for I am gentle and humble in heart, and you will find rest for your souls. For My yoke is easy and My burden is light” – (Mat 11:28). This is the passage that Pastor Paul preached and God saved me through nearly 14 years ago. Since then, and from here on out, I have been amazed at what God has done and what He is doing even now. From all the people that you and Jane Guay have served over the past 15 years, WE LOVE YOU and THANK GOD FOR YOU BOTH !!! To God be glory, great things He has done !! !